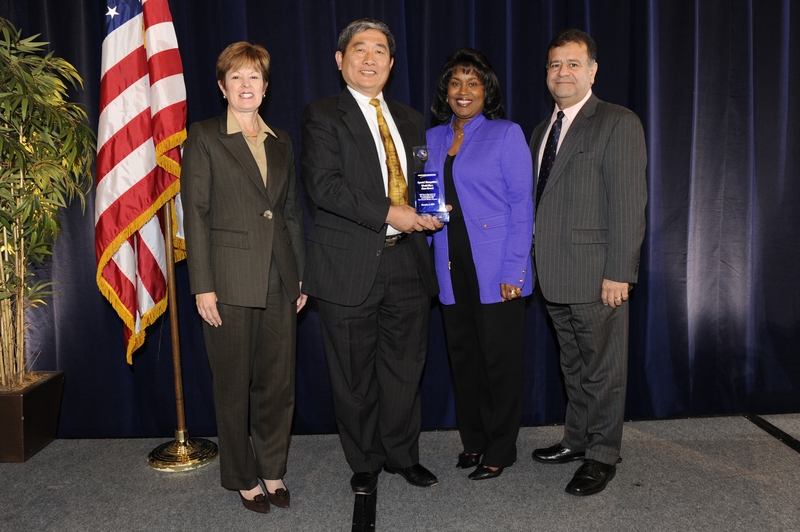 LOS ANGELES, Dec. 10, 2009 -- Northrop Grumman Corporation (NYSE:NOC) presented awards to 24 employees and 42 suppliers at its annual recognition event on Dec. 4, 2009 in Redondo Beach, Calif. The employees and suppliers were recognized for their outstanding performance and support of the company's Socio-Economic Business Programs (SEBP). "The employees and suppliers that were selected to receive World Class Team awards have greatly contributed to the success of Northrop Grumman's Socio-Economic Business Programs. The hard work and dedication that they displayed is truly impressive," said Susan Cote, vice president of contracts, pricing and supply chain. SEBP programs play a key role in connecting small businesses' capabilities with Northrop Grumman government programs in the supply chain and technical organizations. This can lead to significant business opportunities. In the 2009 fiscal year, Northrop Grumman awarded $9.78 billion in subcontracts, with small businesses receiving more than $4.6 billion (47.2 percent) of these awards. The suppliers recognized with World Class Supplier Awards consistently demonstrated responsiveness and flexibility to help meet Northrop Grumman needs along with high quality of work, on-time delivery, outstanding cost management and reliable performance. Suppliers honored with recognition awards were ADEPT Technologies, Advanced Metals Machining LLC, Alabama Aerospace, Anacomp Inc., APR Consulting, Inc., Astro Seal, California State University, Los Angeles, Celltron, Century Precision Engineering, CHI Systems, Inc., Coast Aerospace Manufacturing, Inc., CPI Aero, Dedicated Computing LLC, Fairview Machine Company, Inc., G-1 Mechanical, Inc., Gasket Specialties, Inc., Hi-Tech Electronic Manufacturing, Inc., Hurlen Corporation, Hydroform USA, Integral Systems, Inc., Jo-Kell, Inc., M & S Marine And Industrial Services, Inc., M7 Aerospace LP, MELHCORP, Mil Tech Electronics, MILVETS Systems Technology, Inc., Mountain Aircraft Services, Inc., NetCom Consulting Incorporated, Orion Environmental Inc., Parisi Associates, Inc., Physical Sciences Inc., Poole & Associates, Inc., Proteus Technologies LLC, Shock Tech, Inc., TC Construction, Inc., Techni-Tool, Inc., Technology Unlimited Group (TUG), Troy 7, Inc., TSR, Inc., US Tool Group, Inc., Vision Systems & Technology, Inc. (VSTI), and White Cliffs Consulting, LLC.